The kings who eagerly dreamed a good and wise king than as before. 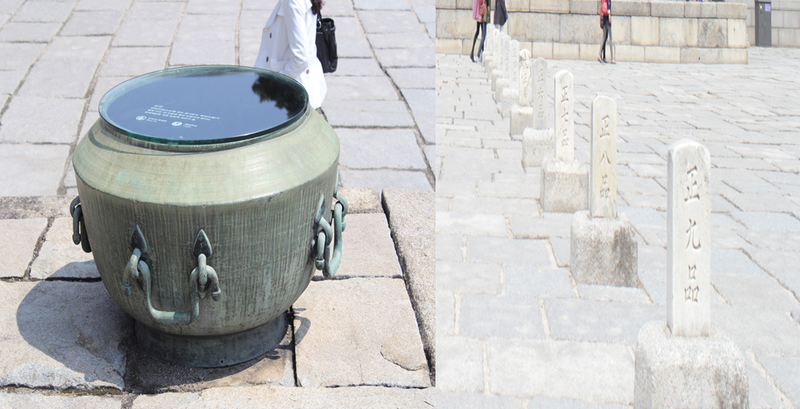 The place where left their passion and anguish, I visited just the Changdeokgung palace complex. The Changdeokgung(창덕궁), literally ‘prospering virtue palace’, is the palace of Joseon Dynasty which is the most beautiful, longest, being loved one to the kings and well preserved place at present time. Changdeokgung was designated on UNESCO World Heritage in 1997 with an outstanding exceptional example of Far Eastern palace architecture and design, blending harmoniously with the surrounding landscape. With this historical and beautiful value, the first ladies of G20 visited this palace in Nov2010 during G20 Summits period. 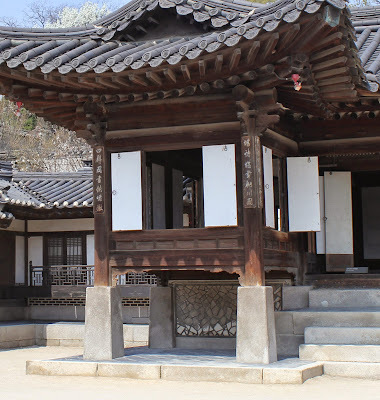 This was built as a secondary palace in 1405 by the order of King Taejong, 3rd king of Joseon dynasty. It is located at the foot of Ungbong Peak of mountain Bugaksan in Seoul. It is named also ‘East Palace’ along with Chaggyeonggung because it is situated in the east side of Gyeongbok palace, the primary palace. Each complex is placed in harmony with the topography without regular system as contrast with the Gyeongbok palace which is overawed and authoritative by standing the line and symmetrical placement in flatland. Korea is mountainous country. As this reason, the kings might be more familiar than the flat main palace. All palace in Hanyang( today’s Seoul) was destroyed by the Japanese invasion (1592-1598). As talking of inauspicious side in Gyeongbok palace, Changdeok palace reconstructed and took over as a new royal court by the King Gwanghaegun until Gyeongbok palace rebuilt in 1865 and was used through several process of destroy and reconstruction till the end of dynasty( almost 500 years). Palace, up to 50000 square meters, is divided into front outer yards consisted of the governmental offices, royal private residential area and inner yards of the rear garden (secret garden).This dynasty was established by the base of Confucian ideology. The principle of it was “Humble and Simple”. It was also applied when the palace complex was constructed. However they did not give up their attempt to make it graceful and elegant instead of being glossy. Especially, garden area (rear garden, secret garden), well composed by pavilions, ponds, trees, oddly shaped stones and rocks shows outstanding view especially boast characteristic and beautiful harmony with nature. This has the feature of untypical aesthetic value of beauty. People thought Gyeongbok palace as the inauspicious site in some side although it was the primary palace according to Fengshui principle, Chinese geomantic principles, many kings preferred to stay new Changdeok palace (창덕궁) from the beginning period of dynasty. This is the oldest main palace gate, built in 1412 and reconstructed during the King Gwanghaegun period(in 1608), and is two stories building where bell and bass drum were installed for alarming of the time(not inside at present time). This was exclusive gate for the king when he went for the Jongmyo shrine where the royal family’s ancestral tablets were placed and ancestral rites were performed regularly during the Joseon dynasty. The gatekeepers’ quarter was changed into the stone wall at now. Besides, a new road was opened between palace and Jongmyo shrine in Japanese occupation period. So it is no more accessible as free as like the past, is true to get an very stuffy impression. 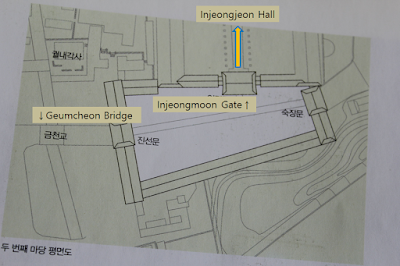 After passing by the oldest Geumcheongyo stone bridge and one gate again, I reached at Injeongmoon gate. In front of this gate, in general, the coronation of a king was held concisely on 6th day of the death of previous king because the throne couldn't leave it empty for long time after death of former king. For a moment, I visualized the ideal and passion of new king in my mind. This yard has the trapezoidal type instead of typical rectangular one. Maybe this was caused by the purpose of avoiding the mountain terrain leading to the Jongmyo shrine. This is the national treasure and main hall of palace. Official grand ceremonies like as audiences with ministers, reception of foreign envoys and so on were held. The external appearance looks like two stories building, but the inside is one story building having the glossy interior and high ceiling. At the front, there were the king’s seat and the folding screen on the back of the chair which means the world of ruling by the king(painted the sun, moon, five peaks and two fast-flowing cascades usually shown in the historic drama in television). Present appearance was reconstructed in 1804 after several destroy and rebuilt. In 1900’, and thus it shows various combined cultural elements by adopting the Western culture( eg, the light, curtain and gloss window was equipped and the clay stone floor was changed into wood). Clay dolls on the eaves of tiled roof, Japsang (잡상,the meaning is several shape) which they are from the characters of Chinese novel HsiYuChi(journey to the West), are the guardians protecting the people from devil. Dancheong(단청), Korean traditional decorative coloring on wood building and artifacts, using only five colors( each color means; blue-east white-west red-south black-north yellow-center), works not only as decoration role but also for practical purposes such as to protect building surfaces against temperature or insects and make the crudeness of materials less conspicuous. Deumeu(드므), the vessel keeping for firefighting water, has the symbolic superstitious meaning that fire devil surprised at his reflection image in the water and ran away. Officials stood in line according to their rank on the back side of the stone. The higher they are, the closer they are to the king. The civil official stood on the east side, the military one did on the west side. Thin layered stone plates being cut along the grain into 10~20-cm-thick slice on the front yard of this building makes this hall more prominent architecture. This type of stone prevented to slip down by the rain and to dazzle by the strong sunlight. Civil service literary examinations were held in this yard. Through the resurface the yard, now a day the stone was replaced with flat type stones, it diminished the scent of the past regretfully. This was used for the king’s chamber at first, used for council in the later. This was rebuilt in 1920 by using the materials of the Gangnyeongjeon of Gyeongbok palace after destroyed by the fire in 1917. At that time, they adopted the style of Chinese in Beijing and Western style in many part of this building. Heuiwooro was the lecture room for the little prince and changed the purpose into the space of traditional doctor for caring the king later. These buildings, Nakseonjae(낙선재), Seokbokheon and Sugangjae, were built in 1847 for the royal concubine in King Heonjong reign. After his first queen died, he exceptionally attended the selection site for coming new queen. But his grandmother chose another girl instead of the girl who was fixed in his mind on. As the no prince was born in three years, he finally took the girl as the royal concubine. This vicinity was composed of humble, simple and in neat like the houses of the Joseon literati, but the hidden refine in places made me feel another aesthetic. The king spent the times with her at his rest time in Nakseonjae. Seokbokheon is the residential house for her on the next door. However, their dramatic love story did not last so long (just for three years only) because the king died of disease at the age of 22. She lived until 76 years old. Love like as the short spring time! The small wall for firefighting has the pattern of ice under the floor. 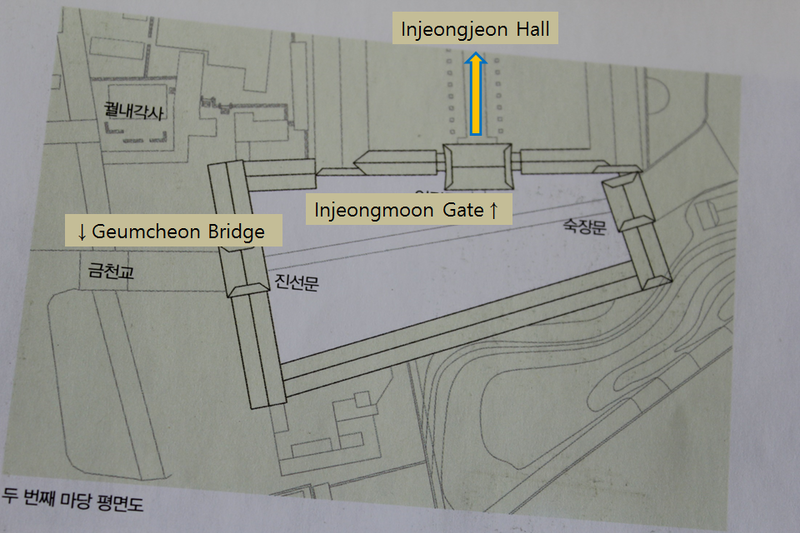 Huwon (rear garden),Biwon (secret garden) Forbidden garden( due to restriction area by the king) North garden (located on the north site). It has been named so many names as before. Present name ‘Secret garden’ was derived from the office name to maintain this garden in Japanese occupation period. However the name used through long period was the ‘Huwon’. They planted the flowers and broad-leaved trees, up to 26000 specimens of 100 indigenous trees, made many beautiful pavilions, lotus ponds and other architectures along the topography in each valley harmoniously. 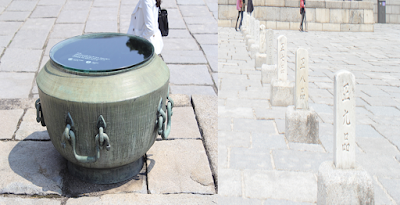 This was accessed from both Changdeokgung and Changgyeonggung palace because there was no barrier between them in the past till Japanese occupation period (1910-1945). This is the palace garden where royal family members strolled and meditated in private. This was used also for venue for banquets, military drill, archery range and so on. In the pond, small islet means round sky and square means land . Buyongjeong(부용정),re-opened in 2012, is the architectural highlight of the Korean traditional pavilion. The cross-shape of the pavilion symbolizes the full blooming lotus and the two stone legs on the front part seem like man submerges his leg to the pond. The King Jeongjo rebuilt this one and changed it into present name. He invited high-ranking officials, made fishing, had their legs submerged on the pond, floated the boat and made poems. Person who did not compose poem in time dropped this small islet as a penalty for a short time. His father was killed in the rice chest by his grandfather King Yeongjo when he was a child. He wanted to communicate with all his heart to his officials and dreamed the new era of Joseon dynasty. The Juhamnu(주합루) of 2 story building located on the opposite site, is the site where preserved and published the books ( on 1st floor) and discussed the knowledge and politics with young talented people(on 2nd floor). The sign board of this entrance(Eosumun) contains his hope that officials show their ability in full in front of king as like fish meets the water. The era without political strife, he was a real good and wise king left many great brilliant achievement. In summer, this pond was filled with lotus flowers. It blossoms beautiful flower in the dirty soil pond. It symbols the men of virtue. This was the pond of gourd-shaped bottle at first and reduced to this size resembling the Korean peninsula map shape. Along the line of this pond each pavilion boasts its beauty of itself. Cheongui pavilion is the place of rice seedling by the king and made the roof from straw cultivated in this field. Roof made from straw instead of heavy tiled roof is very impressive and skinny pillar and rafter looks very light like as slim girl. This residential area having 120 rooms was built for the Jinjakrye ceremony of King Sunjo by Crown Prince Hyomyeong in 1828 and rebuilt in 1865. It has the style of household of the gentry despite of location in the palace area. King Sunjo lived here for a short year when he substituted his thrown into his crown prince. This has double zone for King’s quarter(Sarangchae사랑채 such as living room) and Queen’s quarter(Anchae안채 such as inner private room). I love this palace which endures so long hard times. Get the detail from their official web site. click here !! !